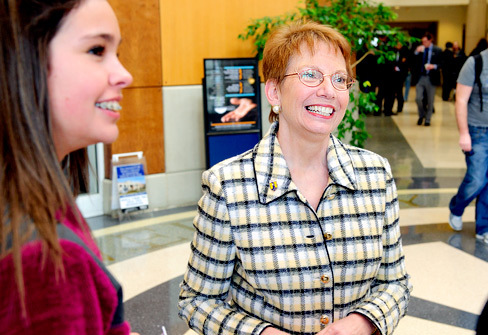 A few weeks ago, I had the privilege of taking part in UNCG's 121st spring commencement. It is quite an experience to witness more than 2,500 students realize this accomplishment as they prepare to step out into the world and effect positive change. It is equally satisfying to see faculty proudly celebrating their students' accomplishments  faculty who are not only award-winners and nationally and internationally recognized researchers, but mentors even past the college years. Indeed, the people of UNCG are defined by the difference they make in students' lives, in scholarly and community-engaged research, and in partnership with our neighbors near and far. This is our community, and we are here for you  in the spirit of access, opportunity and innovation. With that in mind, I am pleased to share a selection of milestones from the 2011-12 academic year. These items exemplify our service to North Carolina and the world. After perusing the links on the left, you can find more stories on the university web site about people who Do something bigger altogether  people like Dr. Spoma Jovanovic, who was recently presented the Robert L. Sigmon Service-Learning Award, and Matthew Williamson, whose personal experience surviving cancer inspired him to major in nursing and follow in the footsteps of those who helped him triumph over his disease. I am so proud of the UNCG community. While Spoma and Matthew are unique individuals, they are not unique to our campus community. There are so many more stories to tell, so many more trails being blazed, so many people who measure their lives by the contributions they make. 2011-12 is the third year of our five-year strategic plan. Faculty and staff across the university have been working diligently to implement important initiatives related to learning communities, student success, health and wellness, internationalization and community engagement. With regard to the latter, engagement is a culture at UNCG. Last fall, at Tom Ross' inauguration as UNC System President, he cited UNCG as a university to watch because of the example we set as an engaged community partner. We have earned a well-deserved reputation as a leader in this arena. I thank all of you  faculty, staff, students, alumni , friends and partners  for making UNCG the supportive, engaged, Do something bigger altogether community that it is. The difference you make is real. No matter the challenges before you, remember that your contributions have the power to transform lives. Copyright © 2012. The University of North Carolina at Greensboro. All rights reserved.